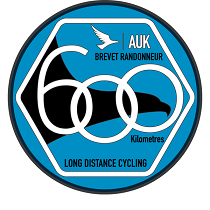 606km cycling event starting from Churchend,Dunmow, Essex. Controls at Red Lodge, Whittlesey, Boston, Kirton-in-Lindsey, Glew's Garage, Goole, Gainsborough, Sleaford and Chatteris. Not entirely flat, but lots of Fenland [beware the wind!] and commercial controls with 24 hour garages at night. Easy night navigation on A & B roads. Breakfast before the start included & floor sleeping Fri night. Budget hotels at around 300 and 400km, though 'Audax Hotels' [bus shelters] are available! Postal finish/pub control.